"One only kid, one only kid, which my father bought for two zuzim. One only kid, one only kid. The cat came and ate the kid, etc. Then came the dog, and bit the cat, etc. Then came the stick, and beat the dog, etc. Then came the fire that burned the stick, etc. Then came the water, and quenched the fire, etc. Then came the ox, and drank the water, etc. Then came the slaughterer, and killed the ox, etc. Then came the angel of death, and slew the slaughterer, etc. Then came the Most Holy—blessed be He !-and destroyed the angel of death that slew the slaughterer that killed the ox that drank the water that quenched the fire that burned the stick that beat the dog that bit the cat that ate the kid which my father bought for two zuzim. One only kid, one only kid." According to the commentators, the legend illustrates how the people of Israel were for centuries oppressed and persecuted by all the nations of antiquity, and how the oppressors all perished one by one, and how Israel, the oppressed, survived. The allegorical explanation of the story is this: The kid symbolizes the Hebrew nation; Yhwh being the father, who bought or redeemed His people through Moses and Aaron (= the two pieces of money) from Egypt. The cat is Assyria, conqueror of Israel. The dog is Babylonia, the next to oppress the Jews. The stick stands for Persia; the fire, for Macedonia; the water, for Rome; the ox, for the Saracens, who conquered Palestine; the slaughterer, for the Crusaders; the angel of death, for the Turk, now ruling over Palestine; and, finally, the Most Holy, for the principle of eternal justice to vindicate Israel, the one only kid of the allegory. Quite an extensive and interesting literature clusters about this curious droll. In 1731 Philip Nicodemus Lebrecht, a baptized Jew, published at Leipsic a tract with the following title: " . Ein Zicklein, das Ist, ein Merckwürdiges Rätzel aus der Jüdischen Oster-Liturgie Welches in Sich Begreifet die Begebenheiten und Schicksahle des Jüdischen Volcks, so Sie von Ausgang Ægyptian biss auf die Zukunft Ihres Annoch Täglich [zu] Erwartenden Messiæ Darunter Verstehen" (comp. Wolf, "Bibl. Hebr." iv. 954, 955). This commentary is borrowed from the Latin of Herrmann von der Hardt, who in 1727 published at Helmstadt an explanation of the "riddle," under the title, "Aenigmata Judaica" (Wolf, l.c. p. 1044; Franz Delitzsch, "Zur Gesch. der Jüdischen Poesie," p. 81, Leipsic, 1836; Steinschneider, "Cat. Bodl." col. 1032). In 1732 Christian Andreas Teuber published in Leipsic another treatise, based upon Lebrecht's, entitled: " , h. e. Wahrscheinliche Muhtmassung von dem Alten und Dunckeln Jüdischen Oster-Liede: Ein Zicklein, ein Zicklein." Wolf (l.c. iv. 1044) gives full information concerning the contents of this book. A number of other Christian writers have published and commented upon this nursery-rime, as though it were a profound philosophical poem, notably Wagenseil ("Belehrung von der Jüdisch-Teutschen Red- und Schreib-Art," 2d ed., pp. 98, 105, Königsberg, 1699) and Bodenschatz ("Kirchliche Verfassung der Heutigen Juden," section viii., pp. 310-319, Erlangen, 1748). 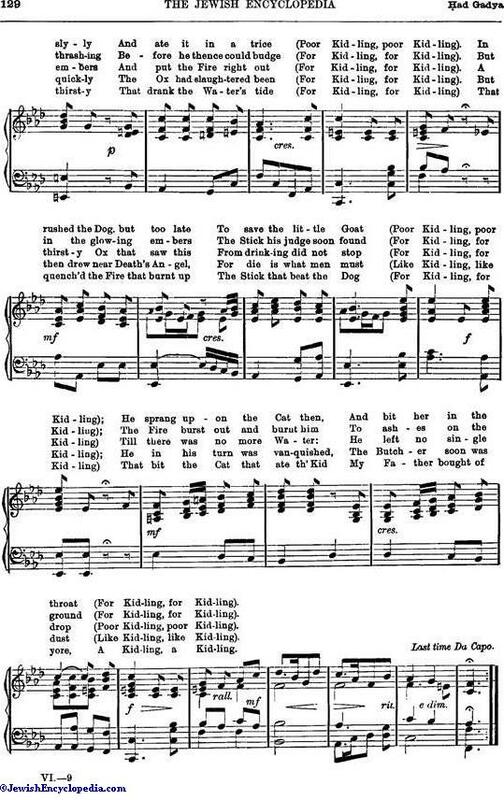 In England, too, the legend was known and discussed in the "London Congregational Magazine" for 1834, whence it was reprinted in New York, 1835, under the title, "A Kid, a Kid, or the Jewish Origin of the Celebrated Legend, 'The House That Jack Built'" (see an article describing this little book in "The New York Times Saturday Review," Feb. 9, 1901). In the preface it is called a "parabolical hymn." Henry George published in London in 1862 an essay on the same subject: "An Attempt to Show that Our Nursery Rime 'The House That Jack Built' Is an Historical Allegory, . . . To Which Is Appended a Translation and Interpretation of an Ancient Jewish Hymn" (comp. Steinschneider, "Hebr. Bibl." v. 63). 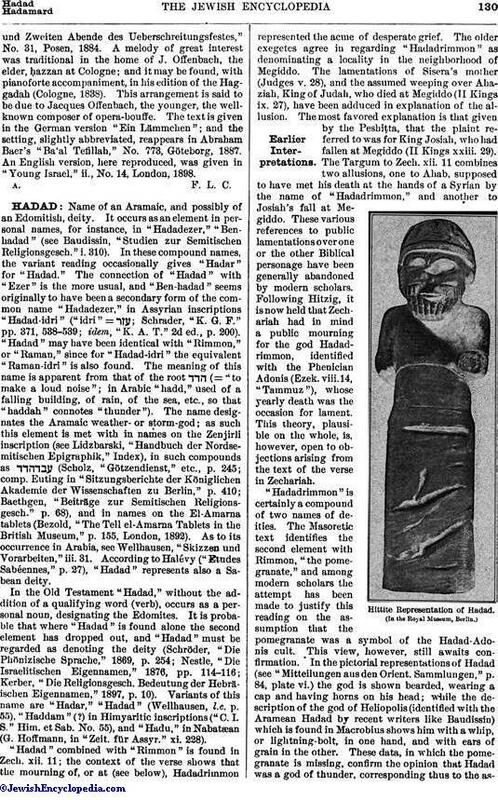 There are, moreover, a number of Jewish commentaries on "Ḥad Gadya." A partial list of them (the earlier items alphabetically arranged) is given in the bibliography to this article. Parallels to this legend may be found in Oriental and Occidental folk-lore. Joseph Jacobs, in the notes to his "English Fairy Tales" (London, 1893), has collected some of the analogues, from "Don Quixote," and from Persian, Indian, and other sources. The origin, however, is now held to be a German folk-song, "Der Herr der Schickt den Jokel aus," a variant of which was sung in certain places in Germany on Sept. 17—a date sacred to a local saint, St. Lambert—and called "Lambertuslied" (see Nork, "Festkalender," pp. 587-588, Stuttgart, 1847). A French chanson, edited by Gaston Paris (see bibliography), is also cited as the prototype of the Chaldaic verses. There are, besides, two other French nursery-rimes, "Ah! Tu Sortiras, Biquette"and "La Petite Fourmi qui Allait à Jérusalem," which bear a striking resemblance to the Jewish legend. 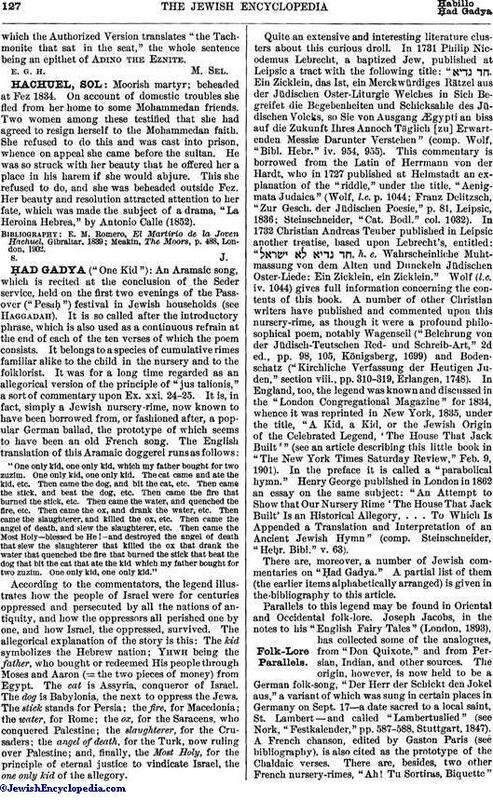 G. A. Kohut has republished (see bibliography) the German, French, and modern Greek variants; but perhaps the most curious analogue, in Siamese, was printed in "Trübner's Record" for Feb., 1890 (comp. "Jewish Messenger," New York, April 23, 1897). As regards the age of the Jewish song, the Prague (1526) edition of the Haggadah does not contain it; but the edition of 1590, published in the same city, prints it with a German translation (comp. Zunz, "G. V." 2d ed., p. 133a; Steinschneider, "Hebr. Bibl." xiv. 52). The Portuguese and South-Arabian (Yemen) rituals do not include either the EḤad mi Yodea 'or the "Ḥad Gadya"; though one Yemen manuscript, in the Sutro Library, San Francisco, is said to contain the latter, added by a later hand, and Zunz found the former in a maḥzor of Avignon ("Allg. Zeit. des Jud." iii. 469). It is interesting to note that a German version of the "Ḥad Gadya" is to be found in Von Arnim and Brentano's anthology "Des Knaben Wunderhorn." Ẓebi Hirsh ben Solomon Salman, , Prague, 1827 (extract from the same author's work, , which does not appear to have been published). Bacher, in Zeit. für Hebr. Bibl. vii. 88-89. Allg. Zeit. des Jud. April, 1902. 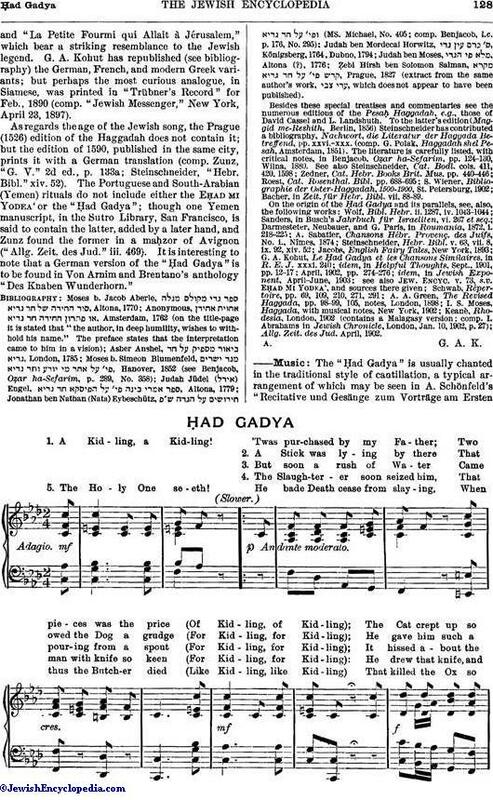 The "Ḥad Gadya" is usually chanted in the traditional style of cantillation, a typical arrangement of which may be seen in A. Schönfeld's "Recitative und Gesänge zum Vorträge am Ersten und Zweiten Abende des Ueberschreitungsfestes," No. 31, Posen, 1884. 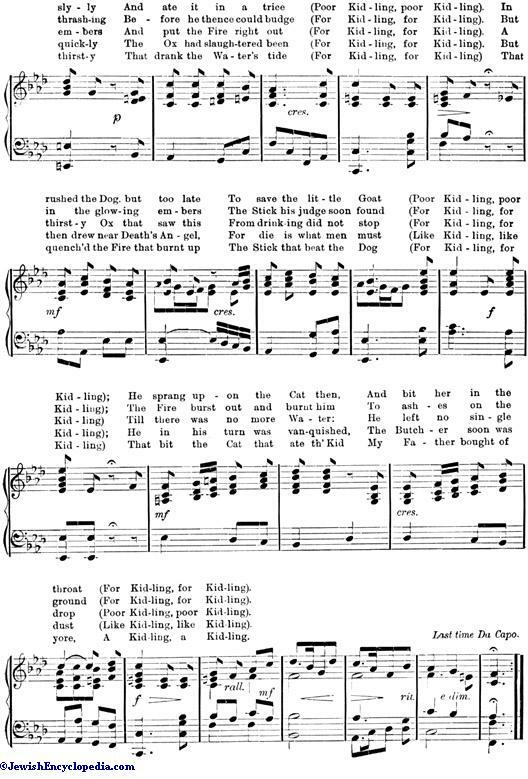 A melody of great interest was traditional in the home of J. Offenbach, the elder, ḥazzan at Cologne; and it may be found, with pianoforte accompaniment, in his edition of the Haggadah (Cologne, 1838). 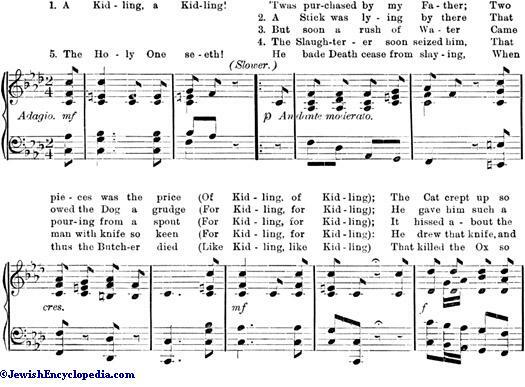 This arrangement is said to be due to Jacques Offenbach, the younger, the well-known composer of opera-bouffe. The text is given in the German version "Ein Lämmchen"; and the setting, slightly abbreviated, reappears in Abraham Baer's "Ba'al Tefillah," No. 773, Göteborg, 1887. An English version, here reproduced, was given in "Young Israel," ii., No. 14, London, 1898.